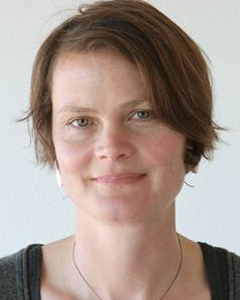 I first became acquainted with architect and philosopher Sarah Robinson in 2012 when I came across her book Nesting at one of my favorite bookstores in San Francisco. After falling under the spell of Juhani Pallasmaa‘s extraordinary book, The Eyes of the Skin, I sensed immediately that Robinson was approaching architecture and aesthetics with a complementary point of view. Turns out Sarah and Juhani are close friends. They have collaborated on a number of publications and seminars, and both of them are continuing to deepen their explorations into a more holistic approach to architecture and the built environment. Their wisdom and research continues to speak to many of my concerns about painting and the experience of the visual in that domain. Since that first introduction to Nesting four years ago, Sarah and I have become friends and cotravelers. Now that she lives in Italy, I spend time with her every time I visit my daughter and her family in Florence. We spent a magical day in Milan last week exploring architecture as well as the back alleys and hidden chambers of Milan’s world famous designers. And lunch was a tireless sharing of favorite books and authors. Note: More Slow Muse posts about Sarah and Juhani Pallasma are listed at the bottom of the review. 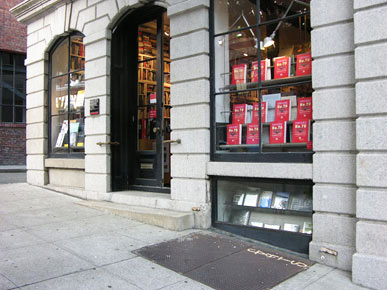 San Francisco’s William Stout Architectural Books is located on the periphery of North Beach, just a few blocks from the better known City Lights. Both bookshops are labyrinthine and lushly overstuffed. But Stout and me, we have a mystical connection. I never leave that narrow two storied jewel box without some treasure under my arm. 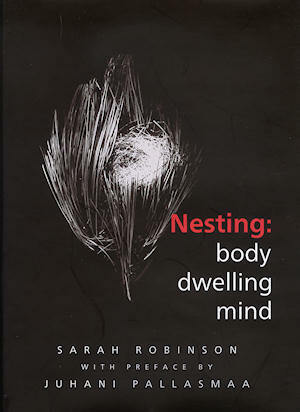 And the latest find is my all time best: Nesting: Body, Dwelling, Mind, by Sarah Robinson. This small book is an exquisite set of essays that goes well beyond the domain of architecture. Her world view blends philosophy, poetry, biology and wisdom to offer a concise and clearly written meditation on how to think about who we are as humans in this grand adventure. My library has a shelf full of books that explore these complex themes of art making and human consciousness (Gaston Bachelard, Merleau-Ponty, Martin Heidegger, Edward Hall, E. V. Walter among many others), and Robinson references many of them in her notes. But none of those writers offer up what she has achieved: A human sized, perfectly tuned invitation into the world of these ideas. Malcolm Gladwell refers to “amplitude” as the gastronome’s measure of how flavors come together in such exquisite compliance that the recipe cannot be improved. Robinson’s book is high amplitude in written form. The introduction was written by Juhani Pallasmaa, an architect and theorist I have written about many times on Slow Muse (and the author of one of my favorite books, Eyes of the Skin.) Robinson’s chapter headings say something about the range of her purveiw: Of Havens, The Mind of the Skin, Practically Unconscious, Dark Matters, Love is Paying Attention, Belonging, To Dwell in Possibility. Each of these chapters could fill several posts, full of provocative insights and the fresh comingling of ideas. And how timely. To read this book about the nature of place and how we are with our world is particularly apropos at a time when all of us are freshly aware of the devastation of homes and communities caught in Sandy’s force field. Our environment mirrors what we have come to believe about our relations and ourselves: that all are re-place-able, the palpable echo of Cartesian solopcism. The natural environment, local culture, and social patterns, once dominant factors shaping the character of a place, are now only marginal determinants…Dislocated from the tissue of community, people are routinely forced to start tabula rasa, a norm all the more insidious because it is equated with freedom. Places [in the past] were not commodities, they were dense contexts of communally-lived history as well as a source of one’s personal identity. Our feelings about a particular place may be personal, but the feelings grow out of collective experiences that do not occur elsewhere. They are specific to and belong to the place. People and place participate in one another’s sustenance, and places perish along with the disappearance of people who cherish them. We dwell in places in a paradgim of mutual influences. More, much more, to come. More information about Sarah Robinson’s architectural practice here. Thanks so much for this update on Sarah’s work. I have loved her book ever since I read about it on your blog. It is one of my go-to gifts for other artists and writers. How great that you are friends and fellow musers now. Thank you Tracy! I am so glad you also connected with her writing. I’ll pass that along! Thank you so much for the introduction to Sarah as well as Juhani Pallasma. I have to order Nesting….